Herein is Cody's write-up for days 13 - 18, featuring zombies, punks, things from other worlds and films from other countries. On July 3, 1984, two medical supply workers inadvertently caused a tank of chemicals, accidentally delivered by the government to their place of employment, to leak, the gas escaping from the tank reanimating the cadaver they had stored in the freezer. In the attempt to destroy the revived corpse, they ended up making the problem a hundred times worse when rain soaked the gas into the soil and revived an entire cemetery of corpses. Dan O'Bannon's film version of this true event is equally frightening and hilarious, the perfect example of a horror/comedy. Most of the humor comes from the hysteria of the characters, their dialogue and the way they react to the insane things going on around them. The characters are fun, with Clu Gulager as the owner of the medical supply warehouse and James Karen as his senior employee, Don Calfa as a mortician, and an ensemble of young adults who get trapped in the cemetery as the dead begin to rise out of the ground. The younger characters aren't your typical horror teens, these kids are all very stylish in their music and social scenes, representing punk, mod, and rude boy. The group includes scream queen Linnea Quigley, who performs a famously awesome impromptu strip atop a tomb. The zombies are fast and dirty, they can speak and are sometimes funny, but can also be terrifying. Playing over all of this is an awesome soundtrack featuring The Cramps, Roky Erickson, SSQ, 45 Grave, and more. This is undoubtedly one of the coolest films ever made. May all the victims of the real tragedy rest in peace. From one of the coolest films ever made, we move on to one of the greatest films ever made. One of my favorite film-related quotes came from Joe Neff, an M.C. of horror marathons in Columbus, Ohio, when he told a podcast interviewer: "Dawn of the Dead makes Citizen Kane look like Maniac Nurses Find Ecstasy." Set sometime after the zombie outbreak began in Night of the Living Dead (1968), Dawn immediately plunges us into a world gone mad, with an intense opening sequence set in a television studio. As an expert and an interviewer have a heated debate and studio employees bail on their jobs, we're caught up on the zombie epidemic situation - it has not gone well since the end of Night, martial law has been declared in the major cities and the latest news is that people will no longer be allowed to occupy private residences - and we're also reminded that the only way to stop a zombie is to destroy the brain or sever the brain from the rest of the body. The story follows four people - pregnant TV studio employee Fran, her boyfriend/traffic helicopter pilot Stephen, and SWAT operatives Peter and Roger - as they set off to find somewhere, anywhere, safe. In what would be a bit of a fantasy fulfillment for some, the place they choose to inhabit is a large shopping mall. We get to watch the process of securing the mall as they seal off the entrances and clear it of zombies, then witness the progress of their lives in this new home. Months pass, society continues to collapse, TV stations go off the air, while they turn an upstairs storage room into a cozy residence and loot the stores of whatever they want. 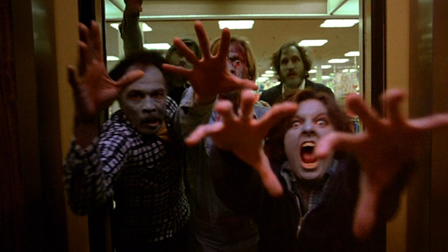 There are some films that I love so much that I can get totally geek-out giddy when talking or thinking about them, and George Romero's Dawn of the Dead is one of those films. This is Romero at the top of his game, delivering a film that is both an amazing drama full of great characters and a really fun, comic book-ish adventure film. The score, a mixture of stock music and music performed by the Italian band Goblin, may be my favorite horror film score. The movie was filmed at the Monroeville Mall in Monroeville, Pennsylvania, and I've made the pilgrimage to that location several times. I've ridden the escalators that the zombies stumble around on, been in the elevator that one of the characters is attacked in, climbed the stairs that are seen in the film but have since been removed. A couple years ago, I even watched the movie in the mall, a projection of the DVD on an inflatable screen. I think I've previously stated on the blog the fact that I'm usually not a big fan of long running times. Dawn is one of the few exceptions to this. There are several cuts of the film; the theatrical cut is 127 minutes, an extended cut is 139 minutes, and the European cut, a much different edit by consultant Dario Argento, is 118 minutes. All three of those were made available in a great set from Anchor Bay several years ago. 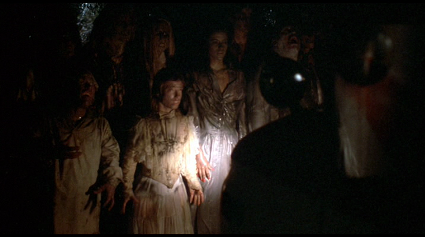 Romero's preferred cut is the theatrical one. I like to be with these characters and dwell in the world of this film for as long as possible, so I've tended to watch the extended cut. There's also a fan edit out there that combines every bit of footage from the three cuts, bringing the running time up to about 155 glorious minutes. I purposely avoid most films based on real life serial killers, but I've always been kind of fascinated with the story of Ed Gein. This mainly stems from my fandom of The Texas Chain Saw Massacre, as Gein was similar to Leatherface and family and was a bit of subconscious inspiration for them. He was also the inspiration for the characters of Norman Bates in Psycho and Buffalo Bill in The Silence of the Lambs. I wasn't sure if Gein even qualified as a serial killer, so I had to check the definitions on Wikipedia: "A serial killer is typically defined as an individual who has murdered three or more people over a period of more than a month, with down time (a "cooling off period") between the murders" ... "Other sources define the term as 'a series of two or more murders, committed as separate events'". In addition to the horror films with characters inspired by him, there are a few movies based directly on the strange life of Ed Gein, and for me Alan Ormsby and Jeff Gillen's Deranged is the best of them. The names are changed - the lead character here is called Ezra Cobb - but the story is reasonably faithful, and even when it strays from the reality, the film is still interesting and entertaining, with a good level of humor and some funny scenes and lines. Ezra Cobb is a middle-aged man who has lived with his extremely overprotective, religious mother for his entire life, during which she has kept him sheltered, always considering him an innocent child, and taught him not to trust women, as they're all disease-ridden and out to destroy him. When his mother passes away, Ezra is completely lost and, after more than a year, comes to the conclusion that he has to dig her up and bring her back home. But she's not in the best condition, so he has to do repairs on her body, digging up fresher corpses and using their skin to replace his mother's rotting flesh, also surrounding her with other corpses to keep her company and using body parts as decorations. Eventually, Ezra branches out from grave robbing and corpse desecrating to murder. 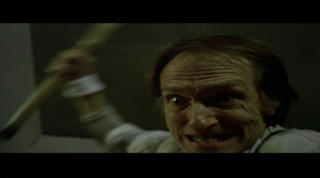 The film is carried on the shoulders of character actor Roberts Blossom, who gives a fantastic performance as Ezra Cobb. The score, largely consisting of an organ instrumental of "The Old Rugged Cross", is creepy, and things are occasionally very gross. This was the first special effects job by Tom Savini and a couple scenes are absolutely disgusting, especially if you get the full uncut version. The story of Let the Right One In follows Oskar, a relentlessly bullied young boy whose parents are divorced. When he gets to visit his father, they have fun together, but if his father's drinking buddy shows up the alcohol wins out over paying attention to him. These situations in his life have made Oskar a little "off", when he's alone he pretends to confront his bullies with a knife and collects newspaper clippings of murders. When a strange girl named Eli moves in to his apartment building, Oskar quickly bonds with her and he soon has a sweet, innocent case of first love. Eli talks Oskar into sticking up for himself for real, he asks her to be his girlfriend... But Eli isn't a normal girl. She's a vampire, and the older man she lives with isn't her father, he's a caretaker who goes out and kills people to get blood for her... At least that has been his job, nowadays he's pretty incompetent at it. This could've been a contender for Favorite Vampire Movie as well, but to be honest it didn't even come to mind for that, because the vampire aspect is a minor element in my enjoyment. There are some great moments involving vampirism and bloodshed, but I mainly enjoy the film because of its dark coming of age story and the amazing interaction between the two young leads, Kåre Hedebrant as Oskar and Lina Leandersson as Eli. Excellently directed by Tomas Alfredson and written by John Ajvide Lindqvist (based on his novel), Let the Right One In is the rare horror film that I thought should've gotten an Academy Award. It should've been up for the Best Foreign Film Oscar, unfortunately, its country of origin - Sweden - didn't even submit it. Regardless, as far as I'm concerned, it was the best film of 2008. In 1938, John W. Campbell, Jr. wrote a novella called Who Goes There?, about a group of men working in an isolated outpost in Antarctica who discover a crashed spacecraft. The alien within the craft is able to assimilate living things into itself, taking their form, mimicking their personality, and every piece of the creature, even its blood, is an independent living organism. The novella was adapted into a film called The Thing from Another World in 1951, but the alien was changed into a much simpler blood-consuming humanoid. John Carpenter's 1982 remake is more faithful to the original novella, and his film is very dark and creepy, full of suspense and paranoia as the characters are unsure which of them is still human and which of them has been taken over by the thing. The characters are in what is practically a no-win situation, trapped with a monster in a completely isolated setting, unable to establish communication with the outside world. Even if they could contact the outside world, should they? A doctor's calculations say that if the thing reaches civilized areas, every human on the planet will be wiped out in a little over three years. The cast making up the group of outpost workers is great, featuring Kurt Russell, Wilford Brimley, and Keith David. Rob Bottin provides the special effects work, and the effects of the thing and the various forms it takes are pretty amazing. Remakes are hit and miss in general, especially in recent years, but John Carpenter's The Thing is an example that a remake can still be a great film. 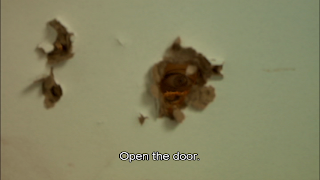 A French film directed by the duo of Alexandre Bustillo and Julien Maury, Inside - or À l'intérieur - is the story of a nightmarish home invasion. A moody build-up gives way to a relentless slasher bloodbath when a strange woman shows up at the home of a widowed pregnant woman on Christmas Eve to terrorize her, trapping her in the bathroom and killing anyone else who enters the house. It's very well-crafted and creepy, and extremely disturbing. This film landed Bustillo and Maury the job to make a sequel to Rob Zombie's Halloween remake, which I thought would be a perfect fit, because the first half of Inside shows that they could deliver suspense and tension similar to John Carpenter's original Halloween, while the second half shows that they could also handle the brutality of Rob Zombie's world. Unfortunately, that deal fell apart, but I'd still like to see what they could do with Michael Myers.